There’s more to the Yucatan Peninsula, Mexico than lounging next to a resort pool in Cancun. So put down your cocktail, back away from the sun lounger and go exploring. There are some incredible experiences waiting for you all over the Riviera Maya and beyond. They are owner/operators rather than an agent, so you are getting the direct price. Offer pick up from Isla Mujeres in addition to Cancun. Most importantly, they strictly abide by the laws for interacting with whale sharks, which is important to protect these amazing creatures. Learn to make authentic and delicious Mexican cuisine in a fun, interactive cooking class. We took a lesson from the talented and enthusiastic Lily, at Rivera Kitchen in Tulum. You will be welcomed into her home and kitchen for an intimate class on Pre-Columbian Mexican cuisine. Learn a little history and culture as you take part in preparing a delicious meal that you will dine on at the end of the class. The Yucatán Peninsula’s limestone geology has more holes than Swiss cheese. The landscape is dotted with sinkholes filled with cool waters that are a divine relief in the tropical heat. Cenotes (see-note-ays) vary from open depressions to semi- and completely enclosed caves. Many of the popular cenotes have been commercialized and turned into the feature pieces of fun parks that offer zip lining and other activities, these are busier and have higher entrance fees. However, there are still cenotes where you can take a dip for a couple of dollars. Our favourite was Chaak Tun (our favourite cenote experience). 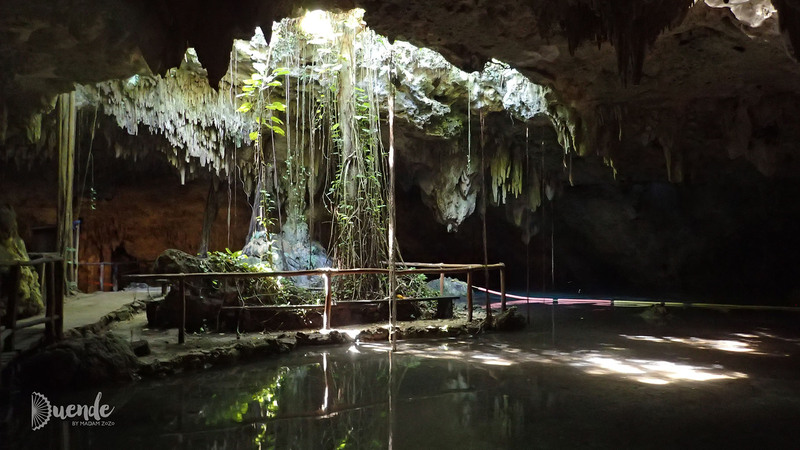 This enclosed cenote is slightly off the tourist trail and therefore gets fewer visitors. When we visited there was not another person in sight! Chaak Tun is a little more expensive because you’ll need to pay for a two-hour guided tour to navigate the dark caves, but it is worth every penny. They provide lockers, wetsuits, snorkel and torch as part of the admission. Take the wetsuit – it’s chilly in there! Note: I would not recommend Chaak Tun for anyone who is claustrophobic. Tulum with its beautiful seaside setting. Ek’Balam known for the preservation of a Mayan king’s tomb. My best advice is to get to the more popular Mayan ruins of Chichen Itza and Tulum right on opening time (generally 8am), before the tourist buses turn up around 10am. This is also the coolest part of the day for exploring. South of Tulum is the Sian Ka’an Biosphere Reserve, a UNESCO World Heritage Listed site preserving over 400,000 hectares of land and 120,000 hectares of marine area. The Biosphere is home to a diverse number of plant and animal species including over 300 species of birds. The original human inhabitants, the ancient Maya, called this region Sian Ka’an “Origin of the Sky.” They created channels through the wetlands, possibly for trade or irrigation purposes. Today you can take a boat ride out to the channel and float down its crystal-clear waters, observing the wildlife along the way. There are package tours for such as visit, but it is also possible to DIY with these thorough instructions by Roaming Around the World. I thoroughly recommend making the time to see Muyil archaeological ruins and following the jungle boardwalk down to the boat dock. From June to November each year, sea turtles nest on the beaches of the Yucatan Peninsula. They are commonly sighted during the day, nibbling on seagrasses just off-shore at Akumal Beach and you can be right there with them! NOTE: Due to an influx of tourists and people getting too friendly with the animals, the laws around swimming with sea turtles at Akumal Beach have recently been changed. It is not clear if free swimming is still permitted or whether visitors must be in a tour group. See a summary of the new laws here. Please respect these endangered animals by following the rules set to protect them. Outside the fishing town of Las Coloradas are a series of man-made lakes used for salt production. As a result of beta-carotene (like in carrots) containing microorganisms that live in the waters, the lakes’ waters are shades of orange and pink. I haven’t personally had the chance to visit the lakes, so I recommend checking out Expert Vagabond’s experience and advice for visiting. 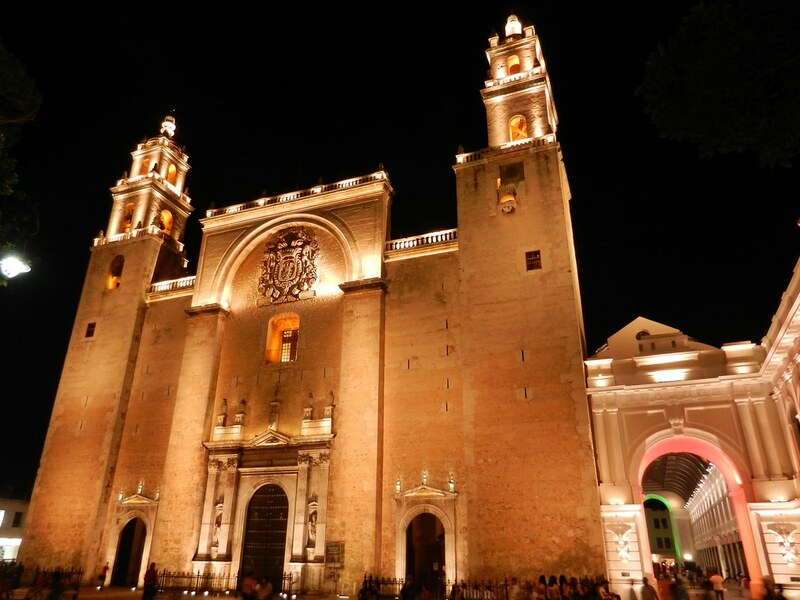 Mérida, founded in 1542, is the capital of Yucatán state and the largest city on the Peninsula. The colonial town was established by Spanish conquistador Montejo y León on the site of a Mayan city. Mérida has a reputation for the beautiful 18th and 19th century architecture of its historic centre, and as a hub for culture and the art. 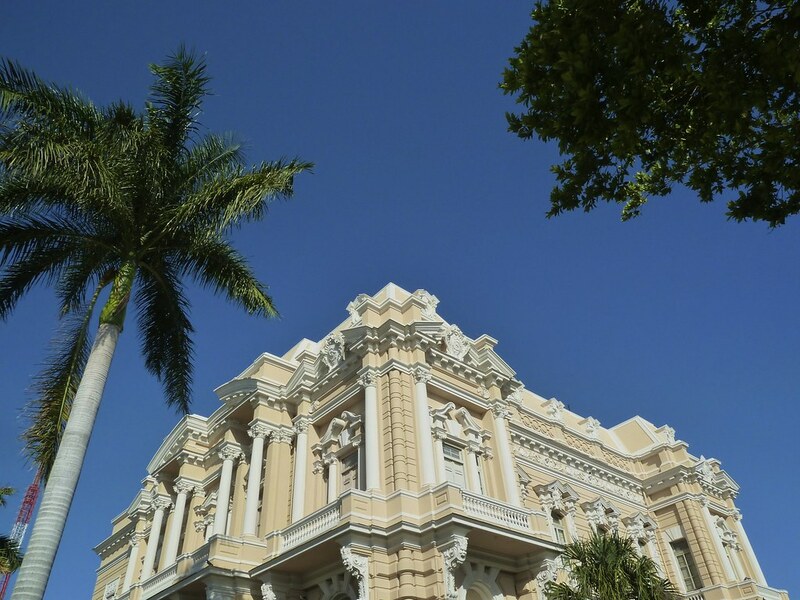 There are so many things to do on the Yucatán Peninsula, enjoy exploring! See these links to get a taste of Isla Mujeres and Tulum street art.